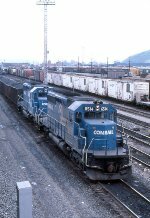 Description: CR SD40-2 6511 leads a six unit consist down Horseshoe Curve in March, 1981. Description: ENAL is rolling out of the yard and toward the Rockille bridge with 65 cars. Description: CR 6511 on the Enola fuel pad in an experiment in visual FX. Odd lighting, 30 second exposure, misty conditions, and a fogged lens yielded this bizarre scene. Description: BUPI heads thru Wampum on the Youngstown Line. Description: A westbound Sea Land stack off the NYSW rolls through CP 293 behind a repainted SD40-2. Some of the older power also got the "Quality" treatment, as you can see.